In nature, most aquarium fish species rarely eat other fish. Only a minority of species are piscivores, yet most aquarium fish diets are based mainly on fishmeal, because it is widely available and comparatively cheap. Yet, there are better ways to feed your aquarium fishes, both nutritionally and ecologically. In 2014 Dr. Stephan M. Tanner and Allen Repashy released a ground-breaking new fish diet: Fruut-Luups. A combination of Papaya, Mango, Organic Banana, and Fig complemented with easily digestible Black Soldier Fly, Krill, and Squid. The idea behind this formula was that in nature fish often eat fallen fruit with all the extras in the form of flying or boring insects and their larvae. While the initial concept was very successful, we further refined this “fruit snack” over time into a more complete, healthy, and nutritious formula. When the rainy season hits, vast stretches of tropical and subtropical rainforests worldwide are flooded. Countless fish species such as tetras, catfishes, loaches, barbs, knifefishes, cichlids, livebearers, killifishes, labyrinthfishes, rainbowfishes, gobies, gudgeons, and oddballs follow the waters flowing into the forests. These “rainforest explorers” are rewarded with a rich bounty of terrestrial and flying insects, other invertebrates, nuts, fruits, seeds, legumes, herbs, and greens; all now in reach because of the elevated water levels. When the original idea for Fruut-Luups was born, the Amazon freshwater swamp forests were very much on our mind. The blackwater-inundated forest is called Igapó and the whitewater type is known as Várzea. Tropical swamp forests contain many legume trees belonging to the bean family (Fabaceae). In fact, Fabaceae is the most common family found in tropical rain- and dry forests in South America and Africa. Hence, we added Pea flour and Alfalfa to the formula, both from the family Fabaceae. Since seeds and nuts play a role depending on the type of forest, we added Almond, Coconut, and Flax seeds to represent these food groups, which contain valuable fats and minerals and act as carriers for fat-soluble vitamins. As a natural source of anthocyanins, we added Black Mulberry fruit powder. There is evidence that anthocyanins inhibit mold formation and work as antioxidants, plus this ingredient gives the new formula an attractive color, smell, and flavor. These ingredients stand-in for native swamp trees and shrubs, as most of these are not commercially available. We retained Organic Banana and Mango, fruits that have proven their worth in many tests series. Consequently, the new formula has a much wider plant base with fruits, nuts, seeds, and pods. High-quality proteins and fats from three major invertebrate groups complement this diet: Black Soldier Fly meal (stand-in for insect), Krill (stand-in for freshwater shrimp, which are very common in the tropics but Krill is higher in eicosapentaenoic acid [EPA], and docosahexaenoic acid [DHA]), and Squid (stand-in for mollusks [snails, slugs, and freshwater mussels]). All these animals are widespread in freshwater swamp forests and the most important protein and fat sources for adult fish to spawn, for juveniles to grow, and for adolescents to fatten up for their long migrations back to their spawning grounds further upstream. These top-shelf nutrients are fortified with our Nutraceutical Premix made from Dandelion, Stinging Nettle, Garlic, Ginger, and Cinnamon based on scientific peer-reviewed research. Natural Carotenoids (no synthetics) including Astaxanthin, Capsanthin, Capsorubin, Beta-Carotene, Alpha Carotene, Beta Cryptoxanthin, Zeaxanthin, Neoaxanthin, Cucurbitaxanthin, Violaxanthin, Lutein, Echinenone, Canthaxanthin, and Lycopene complement the tested Repashy vitamin and mineral premix. 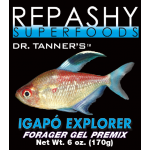 Hence, Repashy proudly introduces Fruut-Luups version 2.0; now more appropriately named Igapó Explorer, our new Rainforest-Forager formula! This food is a complete diet for numerous aquarium fish species including tetras, barbs, danios, catfishes, loaches, cichlids, killifishes, livebearers, knifefishes, labyrinthfishes, rainbowfishes, gobies, and many oddballs such as puffers. Even many saltwater species spending their childhood in mangrove nurseries or many coral grazing species will devour this food with gusto. Bon Appétit! Our formula for all Rainforest Species. Contains Invertebrates, Nuts, Fruits, Seeds, Legumes, Herbs and Greens. INGREDIENTS: Black Soldier Fly Larvae Meal, Krill Meal, Banana Powder, Squid Meal, Mango Powder, Pea Flour, Mulberry Fruit Powder, Dandelion Powder, Seaweed Flour, Almond Flour, Coconut Flour, Ground Flax Seed, Alfalfa Meal, Locust Bean Gum, Citric Acid, Lecithin, Stinging Nettle, Garlic, Ginger, Cinnamon, Phaffia Yeast, Dried Watermelon, Rosehips, Hibiscus Flower, Marigold Flower, Calendula Flower, Paprika, Turmeric, Dried Kelp, Calcium Propionate and Potassium Sorbate (as preservatives), Magnesium Amino Acid Chelate, Zinc Methionine Hydroxy Analogue Chelate, Manganese Methionine Hydroxy Analogue Chelate, Copper Methionine Hydroxy Analogue Chelate. Vitamins: (Vitamin A Supplement, Vitamin D3 Supplement, Calcium L-Ascorbyl-2-Monophosphate, Vitamin E Supplement, Niacin, Beta Carotene, Pantothenic Acid, Riboflavin, Pyridoxine Hydrochloride, Thiamine Mononitrate, Folic Acid, Biotin, Vitamin B-12 Supplement, Menadione Sodium Bisulfite Complex). Guaranteed Analysis: Crude Protein min. 30%, Crude Fat min. 8%, Crude Fiber max. 5%, Moisture max. 8%, Ash max. 10%. DIRECTIONS: Bring water to a boil on stove, in microwave or kettle. Pour boiling water into a bowl and immediately stir in powder (1 part powder to 2-3 parts water). Let cool or immediately pour into mold. Gel will set at room temperature. Cut into pieces or make into a slow release Jerky. Once made, gel should be treated as fresh food and can be vented and refrigerated for up to two weeks, or freezer for up to six months.